It looks like the Syrian Air Force's Fulcrums are getting their hands much dirtier all of the sudden. They have previously been filmed orbiting over hotspots in the Syrian Civil War but video of them actually engaging ground targets was far from common. 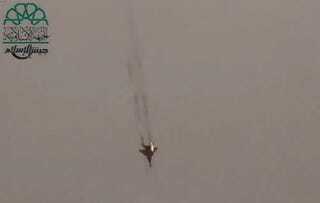 Then we saw the incredibly dramatic footage of what loops like a first person strafing attack by a Syrian Air Force MiG-29. Now, just a couple days later, we have video of a MiG-29 executing a bombing run and one that depicts a MiG-29 making rocket attack passes on a rebel positions, along with a bonus footage of an aggressive MiG-23 working down in the weeds on a hunt. For whatever reason, Assad's commanders have chosen to put their premier, albeit dated, air defense fighter into the role of a ground pounder. Could this signal that parts for his remaining ground attack fleet have become unserviceable, or that the MiG-29 squadrons finally had a enough with sitting on the sidelines?